One of my favorite poets ,Carolyn Forche, has written an incredible account of her years of involvement with El Salvador. Courageously lived, passionately experienced, amd beautifully written. Forché, a poet invited to bear witness to the events evolving in El Salvador during the seventies onwards: the Resistance, the brutal and savage repression by the military, and the plight of all from Church figures to campesinos. Death squads. Young men recruited with the promise of highly specialized military careers and the benefits of such to find they walked into a trap; there is no escape. Quick death is the best hope. "What am I trying to say with these declarations? What can be done with the truth of one person?" - "Alex"
Forché spends a good deal of time relaying her observations; having not read her poetry I came to this unaware of her. Having grown up in the Caribbean, much of this was not surprising. Yes, the extent, the sheer numbers of the missing and dead and the warnings are different. But, as a child I knew people who were marked for death, little black dots beside their name on lists. The rampant inequity, the glib boasting of the favored young fleeing Haiti after Baby Doc's downfall and the refrigerated parlors where women could wear their fur coats. None of this is a surprise. I don't photograph corpses unless there are people nearby, living beings, unless the photograph can have some meaning. This is brutal in description. I was surprised with how unprepared Forché seemed, like a blank page. Throwing up at the sight of her first corpse. How strange it seemed. But your first brush with real fear--when you walk the edge--you never forget and it reemerges again when tested. That visceral connection Forché does well. I suppose if one knows nothing this is shocking. If anything, it was like watching the naive walk through a minefield--yes, I know someone who did that too. Sometimes, what you don't know will save you, only sometimes. Sometimes, it will kill you too. Overall, powerful in an understated way. It provides an understanding for how America's actions affect other nation states. Even the photos included provide context not voyeuristic consumption. I am surprised that there wasn't poetry. I shall look for it elsewhere. Forche is a phenomenal poet, and her poetry has long hinted at a raucous and rebellious life lived just beyond the margins, just out of sight of an ordinary existence. This is the story of that life, written with the poet's eye and ear for stark detail and with a born storyteller's narrative instinct. Immerse yourself in this woman's life. It will change the way you live your own. 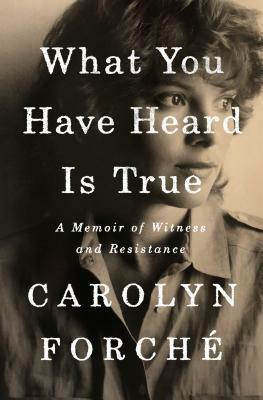 Carolyn Forché - Carolyn Forch was born in Detroit, Michigan, in 1950. She studied at Michigan State University and earned an MFA from Bowling Green State University. Forch is the author of four books of poetry: Blue Hour (HarperCollins, 2004); The Angel of History (1994), which received the Los Angeles Times Book Award; The Country Between Us (1982), which received the Poetry Society of America's Alice Fay di Castagnola Award, and was the Lamont Poetry Selection of The Academy of American Poets; and Gathering the Tribes (1976), which was selected for the Yale Series of Younger Poets by Stanley Kunitz. She is also the editor of Against Forgetting: Twentieth-Century Poetry of Witness (1993). Among her translations are Mahmoud Darwish's Unfortunately, It Was Paradise: Selected Poems with Munir Akash (2003), Claribel Alegria's Flowers from the Volcano (1983), and Robert Desnos's Selected Poetry (with William Kulik, 1991). Her honors include fellowships from the Guggenheim Foundation, the Lannan Foundation, and the National Endowment for the Arts. In 1992, she received the Charity Randall Citation from the International Poetry Forum. "